The main common ingredient in a coffee and an espresso is the use of coffee beans. The primary difference in these two forms of drinks is the way it is made. The difference between a cup of coffee and a shot of espresso is how it is brewed and in the flow of water. An espresso shot is more concentrated with high caffeine content. The following are a few major differences between them. 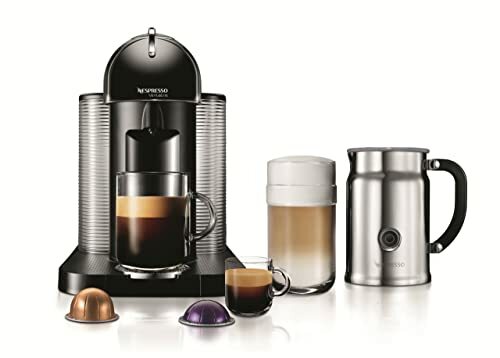 Both use the same coffee beans, but the variety of beans used in preparing them wholly depends on the retailer or the coffee shop that sells coffee and espresso. The espresso requires the coffee beans to be grounded very finely. The beans in an espresso are roasted for a longer time and the blend in usually dark, and strong. Any type of coffee bean at any roast level can be used to prepare an espresso. The choice of roast depends on your liking. In a coffee the beans can be ground to different variety coarseness depending on the type of brew like a drip coffee, percolator, and French press. Espresso is also prepared using an espresso machine, but the coffee grind needs to be very fine. All Espressos are coffee, but all coffees are not espresso. What makes an espresso unique is the brewing technique. A special espresso machine is used to brew espressos, though you can make espresso in a pot on a stove, but the final product is much inferior than the one brewed using an espresso machine. An espresso machine should be used if you need to drink good quality and a perfect espresso. One to two espresso shots are made at a time taking around 20 seconds each. All this process goes through a carefully set temperature and pressure to produce an extraction that is popularly known as espresso. The process requires the grind to be very fine to create a dense puck to maintain a constant pressure for extraction. Here, the role of an espresso machine is very crucial as it helps maintain constant water temperature and also aids in controlling the pressure and duration of the extraction, which cannot be produced on a stove. In an espresso finely ground coffee is compressed into dark and dense coffee along with hot water. Espresso blends contain a small percentage of Robusta beans to produce light brown colored foam on top of the espresso shot. Milk is usually not used in an espresso. Coffee on the other hand is prepared by combining the correct portion of ground coffee beans along with hot water. A percolator, a drip-coffee maker or a French press is used to prepare a coffee. A coffee makes use of a filter and the brewing process, which takes a minimum few minutes to even half an hour depending on the percolator. The water is filtered through the coffee and collected in a pot. Usually milk is used in a coffee. Coffee made using a percolator is called as filter coffee in many Asian countries. Cappuccinos, Lattes, and Mochas are some of the most popular espresso beverages. These beverages are made using espresso shots, and foamed or steamed milk. Even chocolate syrups are also used in some beverages. Espresso is served with or without milk. They are generally drunk using an espresso cup, which is much smaller than a coffee cup. Coffee is prepared using milk with cream and sugar or without milk. A large number of coffee drinks are very similar to espresso beverages with milk. A drip coffee is prepared by dripping boiling water over the ground coffee. Coffee mixed along with steamed milk is called misto. Espresso is very popular in the United States, Europe and many South American nations. 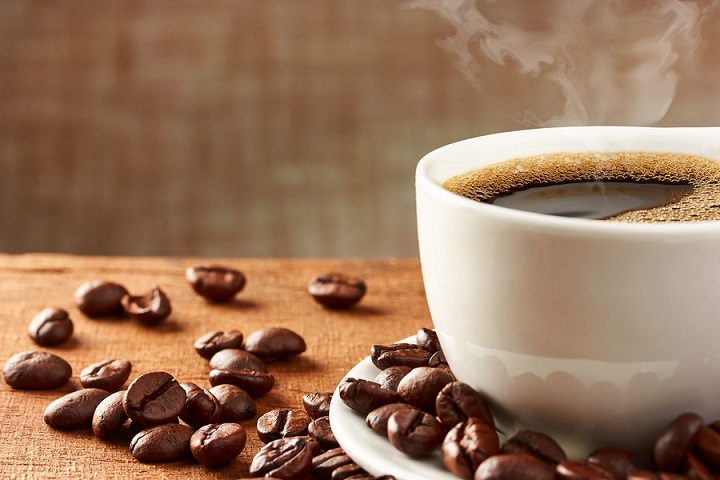 Coffee on the other hand is the most popular morning drink of majority of people worldwide. Cappuccino and Lattes are the most liked coffee based drink around the world. In countries like the United States coffee is also sold as espresso roast, which is typically a dark roast variety of coffee beans with an oily surface. Coffee beans come in different variety flavors depending on the brand. Espresso cannot be prepared using flavored beans. Only unflavored beans are used in making an Espresso. Flavored syrups are added additionally to an espresso to give a flavor to lattes and cappuccinos. The flavors include vanilla, raspberry, and hazelnut to name a few. 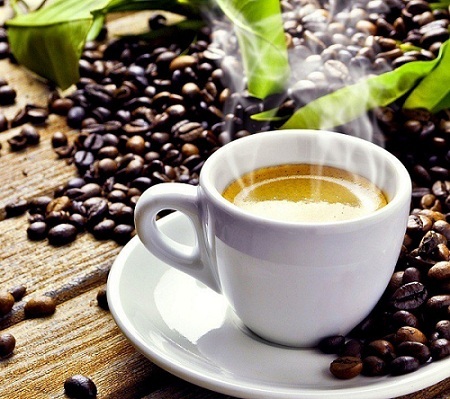 Even coffee can be prepared using these flavors, but this is not required as you can use flavored beans to make coffee, which is not possible in an espresso. Different blend of types of coffee beans from various countries can be used to make an espresso. Espresso uses less water and is dark and strong, a preferred choice of many people in Europe. The basic rule in an espresso blending process is the subdued levels of acidity. It should be heavy-bodied and be sweet enough to bring a balance in the bitter and acidic flavors in the blend. Espresso has a lot more caffeine and taste as compared to coffee. Espresso is the other name for concentrated coffee and the regular coffee is called the watered down coffee. This is why we find the cups of espresso much smaller than the cups of coffee. Because of the high concentration of caffeine and taste espresso can be used to make other beverages like Mocha. Espresso drinks can be made hot or cold according to your preferences. Just by using different brewing techniques the same coffee beans can used to make different variations of drinks, which is quite surprising. This is possible due to the flexibility of the coffee beans. Coffee is the most generic term used by most people. A good quality coffee or an Espresso depends on the good source of fresh coffee beans. It is the brewing technique that makes these beans assumes different flavors and taste. The choice of drink solely rests on each individual’s personal taste.